At the Austin, Texas office of Betty Blackwell, Attorney at Law, you will find a skilled Texas trial lawyer capable of handling your drunk driving or DWI/DUI, driver's license suspension, family violence, or other criminal charge. For over 30 years, Betty has served residents of Austin, defending them against criminal charges. Betty is Board Certified in Criminal Law by the Texas Board of Legal Specialization and 100% of her work is in criminal defense. As a Texas trial attorney, Betty's experience has taught her the importance of being able to represent clients in front of a jury, if need be. 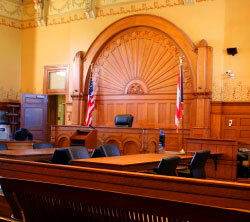 She has handled thousands of DWI cases and represented clients in numerous jury trials. When you contact Betty, you can be assured that she will fight for your rights and the best possible result whether or not you decide to go to trial. When you hire an attorney, make sure that the lawyer you hire will be the same lawyer standing next to you in court. Our initial consultations are free, so you have absolutely nothing to lose. Contact the Law Office of Betty Blackwell in Austin, Texas for aggressive, qualified defense against your DWI, family violence, or other criminal charge. Let Betty bring her experience as a Board Certified Criminal Defense Lawyer to your case today.